Sepp Blatter warned Gianni Infantino on Sunday that miracles will be expected from him as the newly elected FIFA president but there will be plenty of backstabbers if he fails to deliver. Blatter, currently serving a six-year suspension from football, saw his 18-year reign as FIFA chief officially end Friday when 45-year-old UEFA secretary-general Infantino was voted in as football’s most powerful man. But in an open letter to the Swiss-Italian lawyer, Blatter warned his successor to be wary of the pitfalls that come with the job. He also said he was ready to offer his help if required. “I congratulate you, but remember however that this position you wanted will not be easy. 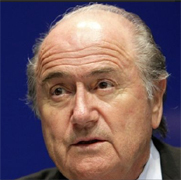 Miracles will be expected,” Blatter wrote in an open letter published in French newspaper,Journal du dimanche. Blatter said that the package of reforms which will be implemented at the scandal-hit body will help Infantino as he embarks on his new era. “The miracles will be helped by the vote overwhelmingly taken for the reforms which I had also started. Blatter said Infantino will be allowed a period of grace but could face stormy waters if reforms are implemented too slowly for the patience of federations and sponsors. The veteran official added that he was looking forward to other challenges in the future now that he is no longer the FIFA chief.